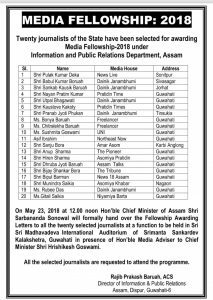 Senior journalist and chief copy editor of Northeast Now, Asif Ibrahim, is among the 20 journalists of Assam selected for awarding Media Fellowship under Information and Public Relations Department for the financial year 2018-19. The decision was made in a selection committee meeting held at the office chamber of the Additional Chief Secretary, Information and Public Relations Department at Assam Secretariat of Dispur in Guwahati. Additional Chief Secretary, Information and Public Relations Department Dr AK Singh chaired the meeting while Director of Information and Public Relations, Rajib Prakash Baruah; Deputy Secretary, Information and Public Relations Department Hemanta Pegu along with four experts, namely, editor of Sadin Anuradha Sharma Pujari, executive editor of Prag News Diganta Oza, assistant professor of Gauhati University, Chandan Kumar Goswami and assistant professor of Krishna Kanta Handique State Open University Dr Trisha Dowerah Baruah attended the meeting. 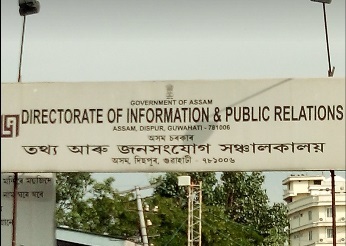 The names of the journalists whose fellowships proposals have been approved are: Pulak Kr Deka of Sonitpur (News Live), Babul Kr Boruah of Sivasagar (Dainik Janambhumi), Sankab Kausik Baruah of Jorhat (Dainik Janambhumi), Nayan Pratim Kumar of Guwahati (Pratidin Time), Utpal Bhagawati of Guwahati (Dainik Janambhumi), Kaustove Kakoty of Guwahati (Pratidin Time), Pranab Jyoti Phukan of Tinsukia (Dainik Janambhumi), Bonya Baruah of Guwahati (freelancer), Chitralekha Baruah of Guwahati (freelancer), Sushmita Goswami of Guwahati (UNI), Asif Ibrahim of Guwahati (Northeast Now), Sanju Bora of Karbi Anglong (Amar Asom), Anup Sharma of Guwahati (The Pioneer), Hiren Sharma of Guwahati (Asomiya Pratidin), Dhruba Jyoti Baruah of Guwahati (Assam Talks), Bijay Sankar Bora of Guwahati (The Tribune), Bipul Barman of Guwahati (News 18 Assam), Munindra Saikia of Nagaon (Asomiya Khabar), Rubee Das of Guwahati (Dainik Janambhumi) and Gitali Saikia of Guwahati (Niyomiya Barta). It may be noted that a total of 66 fellowship proposals were received for the fellowship award. The Information and Public Relations Department has for the first time introduced the scheme, ‘Media Fellowship for Journalists’ to help the journalists improve their professional skills and upgrade their knowledge in journalism. Under the scheme, every year 20 fellowships will be awarded to journalists @ Rs 50,000 each. 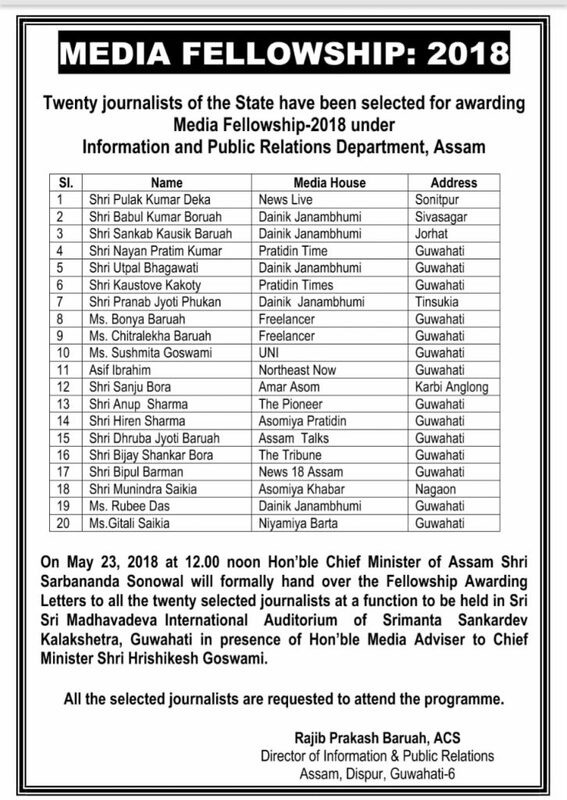 Assam Chief Minister Sarbananda Sonowal will formally hand over the acceptance letters to all the twenty selected journalists in a function to be held at Sri Sri Madhavadeva International Auditorium of Srimanta Sankardev Kalakshetra, Guwahati on May 23 next. Media Adviser to Chief Minister, Hrishikesh Goswami will grace the function as the Guest of Honour.